While the iX3 is set to make its commercial debut in 2020, the other two models are expected to enter the market sometime in 2021. BMW seems to be going all-out to prove its seriousness regarding all-electric vehicles. After all, it isn't every day that we see a manufacturer attaching shots of its own camouflaged test prototypes with a release. Well, this is exactly what's happened this time though. 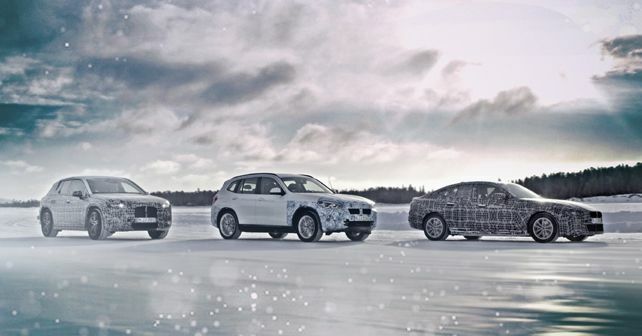 What we see in the images are the next-three BMW i models undergoing winter-testing in Arjeplog, Sweden, near the BMW Group's winter test centre. Though all three models seem to be at par in terms of development and testing, BMW has revealed that the iNext and the i4 will only go into production in 2021, meaning that their commercial debut is likely to take place by the end of the same year. Meanwhile, the iX3 SAV (as BMW calls it) will debut in 2020. While the cars might seem more or less production-ready in camouflage, details about them remain vague and scarce at the moment. The iX3, a Sports Activity Vehicle, will become the first model to feature the brand's fifth-gen eDrive technology. The latest eDrive tech means the iX3 will get a powerful electric motor combined with a high-voltage storage unit featuring state-of-the-art battery cell technology. All of this translates into the fact that the iX3 will boast a driving range north of 400km without compromising on performance and will be charged using 150kW DC charging stations. The iX3 will also be the first model to be produced for the global market via the BMW Brilliance Automotive Joint Venture, based in Shenyang, China. Next up, the i4 four-door 'Coupe' will also feature the same powertrain tech as the iX3 but will offer an even higher driving range of nearly 600km on a single charge. Further, BMW has revealed that the i4 will be able to sprint from 0 to 100km/h in about 4 seconds and will have a top speed north of 200km/h. Unlike the iX3, the i4 will be produced at BMW's facility in Munich. Finally, the iNext (as suggested by the name), will be BMW's 'technological flagship' as it is expected to bring in the 'next' level of electric mobility. Underpinned by the same fifth-gen eDrive setup, the iNext will feature BMW's future modular platform, offer a driving range similar to that of the i4 and will be designed for Level 3 automated driving. As of now, the only definitive detail available about the iNext is that it will enter production in 2021 at BMW's Dingolfing plant. With this, we expect that BMW's future all-electric line-up should have something in store for almost everyone seeking to switch to electric vehicles.